If you are looking for a fun-filled family atmosphere combined with the thrill of the races and the enjoyment of gambling, SunRay Park and Casino is the place to go. This track offers something for everyone from gambling to food, SunRay Park and Casino offers a well-rounded and enjoyable atmosphere. If you travel to Road 5568 in Farmington, New Mexico, you'll find a great little track with plenty of atmosphere just waiting for you to join in on the fun. SunRay Park and Casino has a warm, laid-back atmosphere which is very inviting to newcomers and regulars alike. 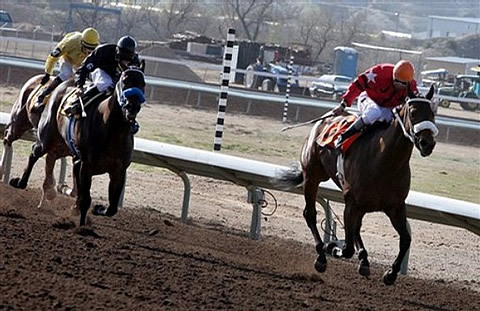 The track is used mainly for quarter horse racing and is open all week-round at various times of the day. It is oval in shape and measures approximately 6 furlongs in length. The homestretch is about 990 feet from the last turn and two chutes. If you're looking for some off-season action, you'll find it at the SunRay Casino. This 12,700 square foot casino has a whopping 503 slot machines inviting you to try your luck. These video slot machines are easy to use and tons of fun to play. If you're not a slot machine fan, you can always retreat to the SunRay Sports Bar and Grill where you'll find friendly faces and great food. Like the casino, the sports bar and grill is open year-round and it focuses mainly on tasty Mexican food. So whether you're looking for great dining with a view of the track or you simply want to spend some time playing the slots, give SunRay Park and Casino a try. It's the fun choice!